Do you like chocolate? I mean really, really love it? Yes! Then you will go crazy for these Chocolate Fudge Brownie Bites. Because these Chocolate Fudge Brownie Bites are C R A Z Y good, which shouldn’t be surprising when you consider how much chocolate is in these little edible, morsels of happiness! 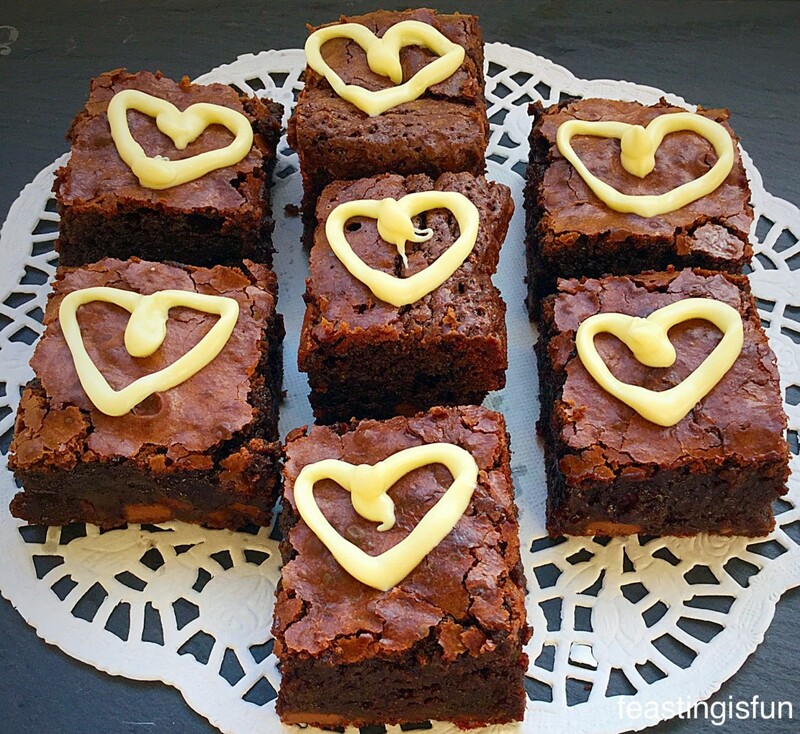 Chocolate Fudge Brownie Bites – sharing the love. 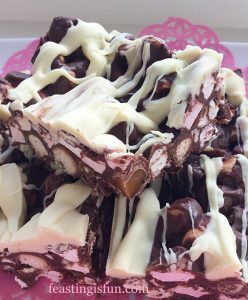 I have a few brownie recipes already on this site, such as Nuts About Brownies and don’t get me wrong, they are all utterly delicious. Yet, I wanted to make a Brownie that stood alone on its own, deep, chocolatey merit. No nuts, no extra topping, apart from the optional white chocolate heart. Just pure chocolate fudge brownie bliss. Oh boy do these deliver. Above all these deliver on deep chocolate flavour, perfect amount of squidge, leavingyou wondering just how these Chocolate Fudge Brownie Bites manage to hold together. Also they have a satisfying depth of sweetness, melting against your tongue. 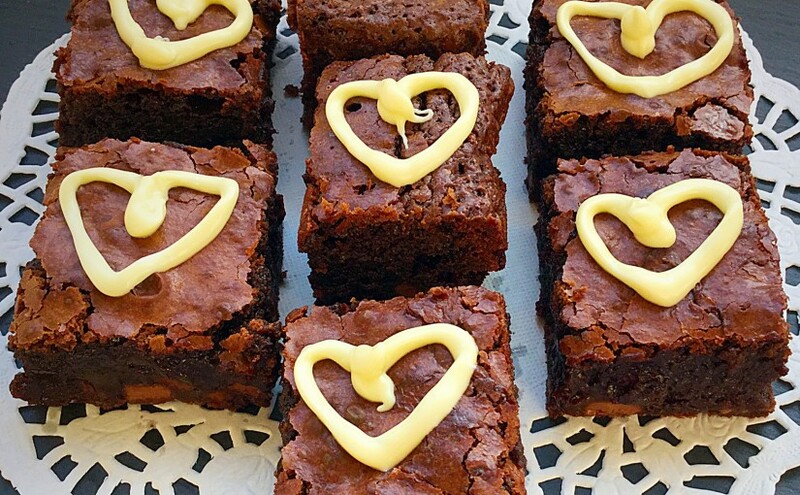 Yep if you want a straight up brownies, no faffing with nuts and the like, just one hundred per cent chocolatey goodness, this is the recipe you need. Finally one quick, yet impoarrant note, these brownies contain A LOT of chocolate, it really is worth using the best quality chocolate that you can afford. It really does make a difference to the finished taste and texture. Method: Preheat oven to 170C/155C fan. First of all line a 22.5cm x 30cm (9″ x 12″) deep baking tin with aluminium foil. 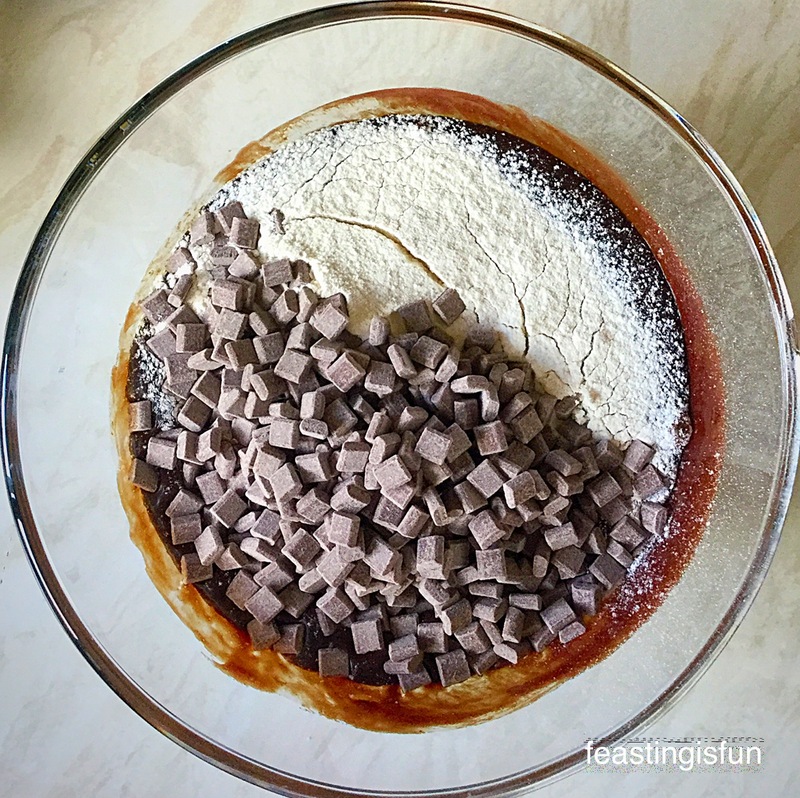 Break up the chocolate (or chop) into individual squares, dice the butter and place both into a heat proof bowl.Place the bowl over a simering pan of water (a double boiler) ensuring the bottom of the bowl doesn’t touch the water. 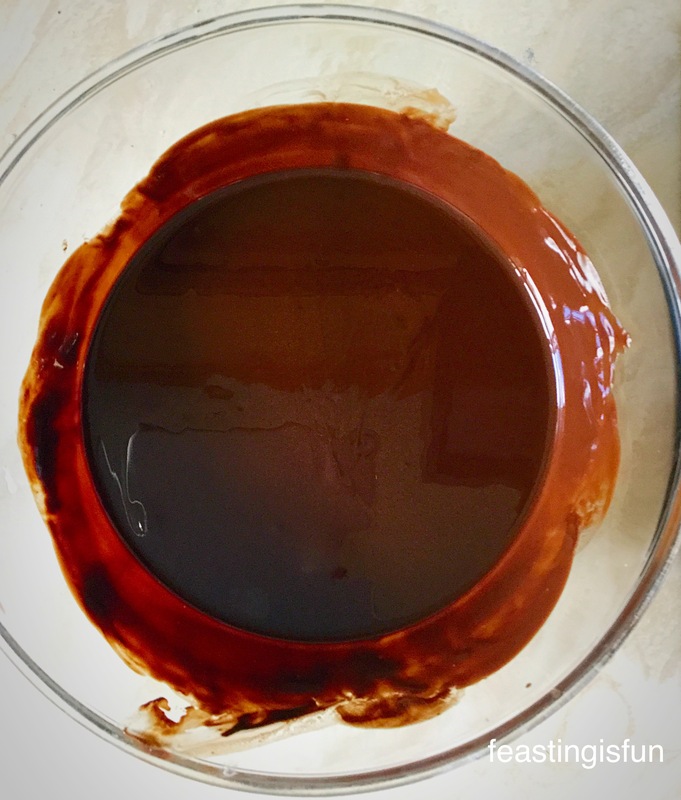 Stir continuously until both the chocolate and butter are two thirds melted. Carefully remove the bowl from the pan and continue stirring until the contents are completely melted. Set the bowl to one side and allow to cool slightly. Into another large bowl add the eggs, vanilla and sugar. 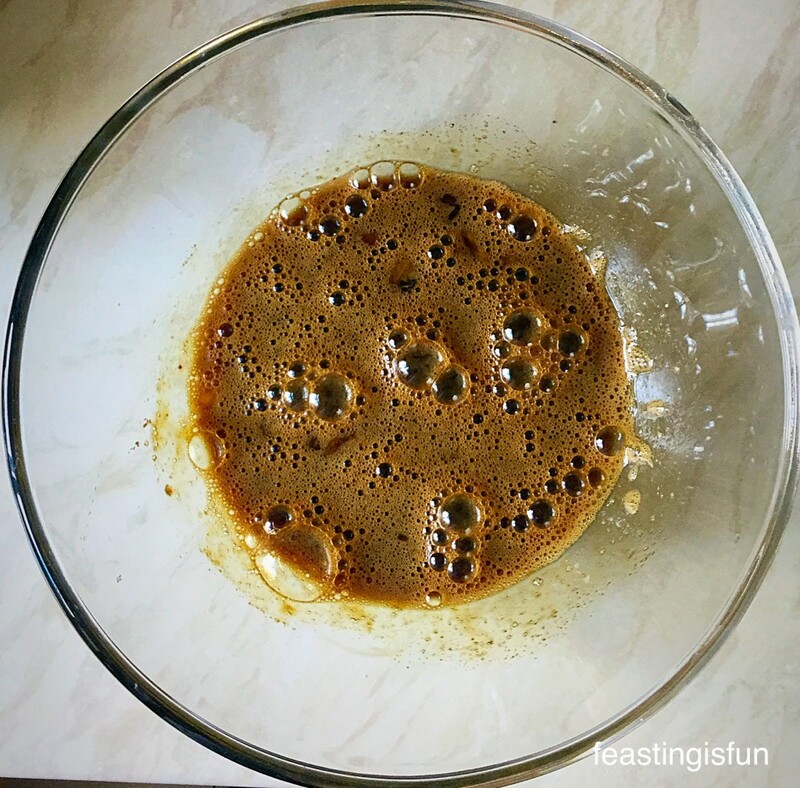 Whilst still slowly mixing pour the cooled chocolate mixture into the larger bowl. Mix until completely combined – try not to incorporate too much air whilst mixing. Sift the flour, bicarb. and salt into the bowl. Ooh this bowl holds so much potential! Using a large metal spoon, fold all the ingredients together. Pour the brownie mixture into the foil lined tray. Chocolate Fudge Brownie Bites ready for the oven. Give the baking tin a good couple of sharp taps on the worktop. This will bring any air bubbles to the surface. Place the baking tin into the oven and cook for 35 – 40 minutes. Halfway through the cooking time remove the tin from the I’ve and give it another sharp tap against a heatproof surface. 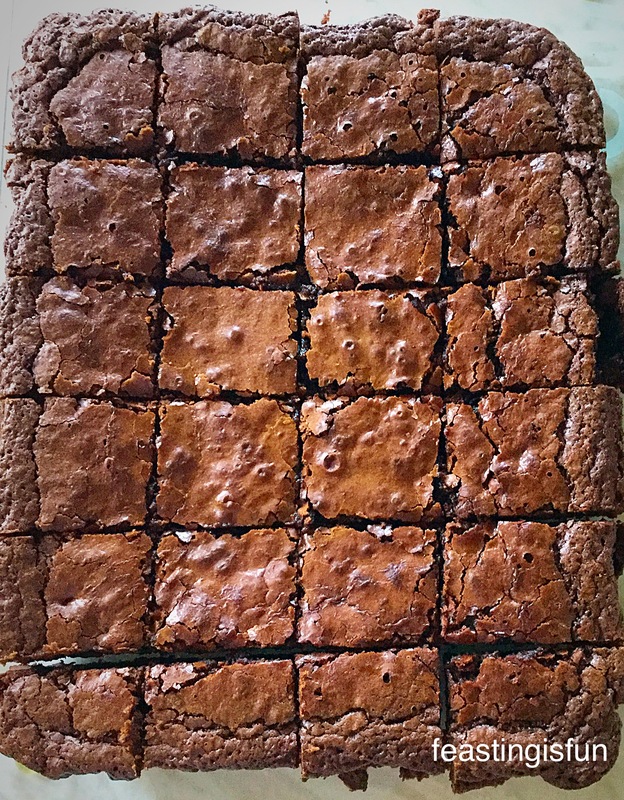 The brownies are cooked when the outside edge has set and the top of the brownies has the familiar, sugar cracked look. There should still be a little wobble to the centre of the tin. As soon as the brownies are baked remove the tin from the oven and allow the brownies to cool completely in the tin. 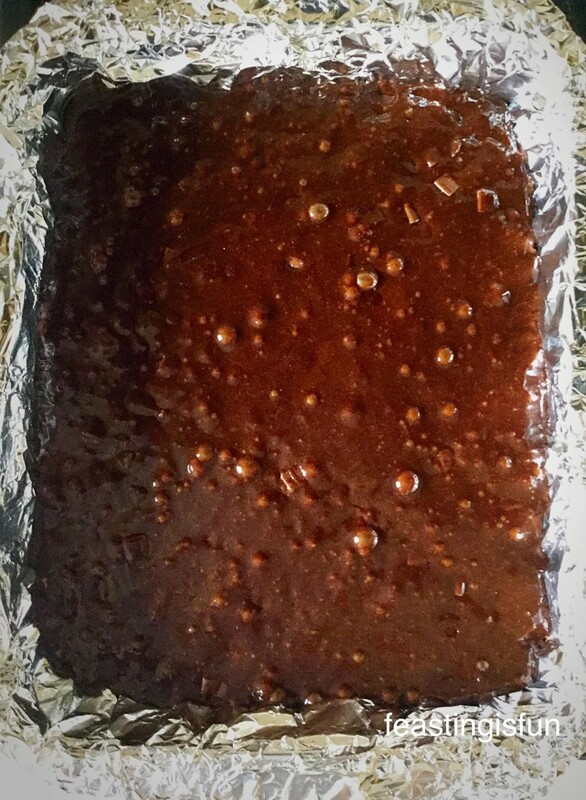 Once cooled turn the brownies out onto a board and removing the foil. Cut across the brownie at 4 even spaces, then cut down at 6 even spaces. Now you have 24 delectable Chocolate Fudge Brownie Bites! These truly are delicious as the are. 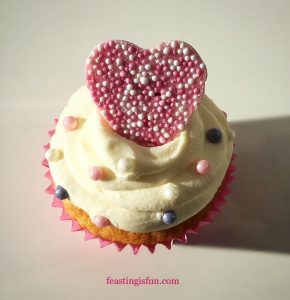 Seeing as Valentine’s Day is almost upon us, I couldn’t resist piping some white chocolate hearts on them. Simply pop some white chocolate, broken up, into a microwaveable bowl and melt using 20 second bursts, in the microwave until two thirds melted. Then stir continuously until the chocolate is a smooth liquid. Spoon the melted chocolate into a small, disposable piping bag and cut the tip off, leaving a very small hole. I found it took a bit of practise, getting even hearts and that it was better if I piped the heart in one complete go. 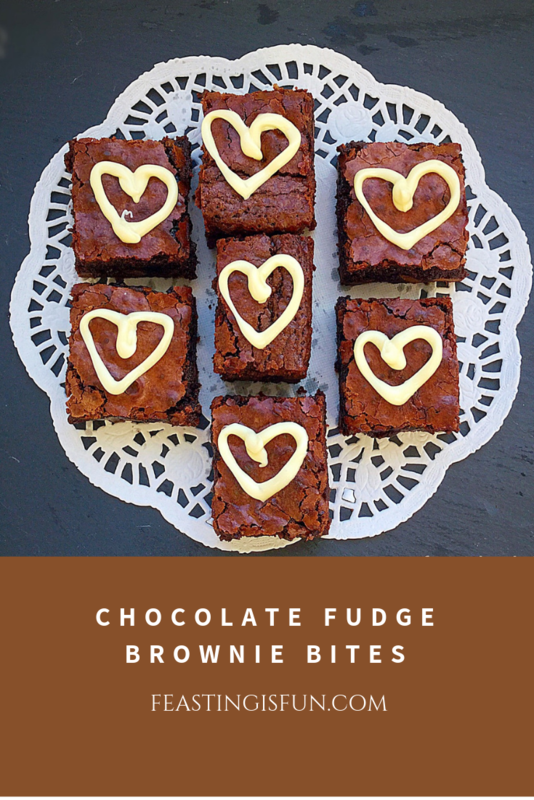 Chocolate Fudge Brownie Bites perfect for sharing with all those you love on Valentine’s Day. 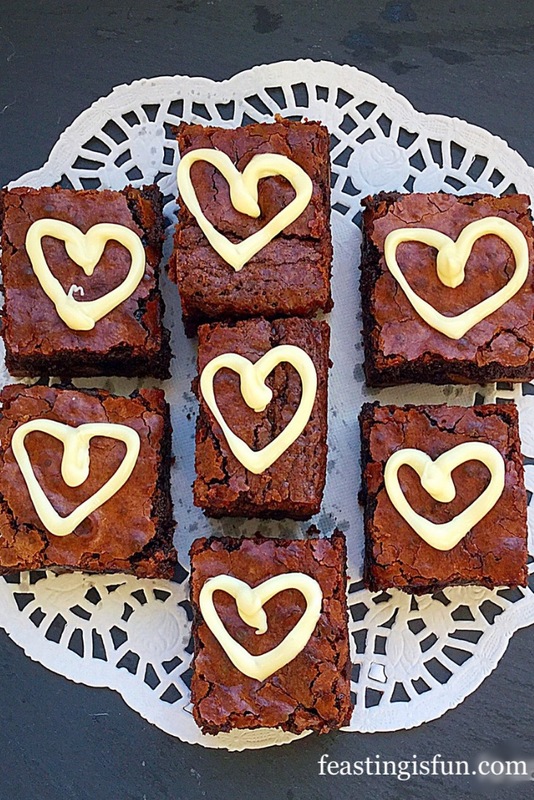 However you pipe your hearts, your loved ones will enjoy these Chocolate Fudge Brownies Bites, not just because they taste so amazing, but more importantly because you have baked them with love, to show people they are loved. Do you like to celebrate Valentine’s Day, with your significant other, or with all of your loved ones? I wish you all a very happy Valentine’s Day and sincerely hope you know that you are loved see Important Stuff. This post is Pink. Very Pink. 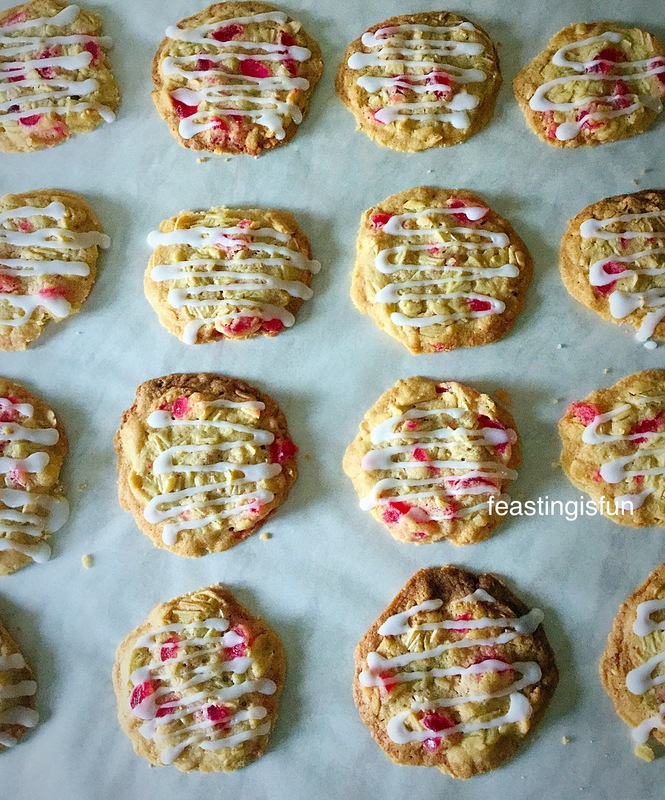 And I make no apology for its pinkness, for one simple reason – Cherry Bakewell Cookies. 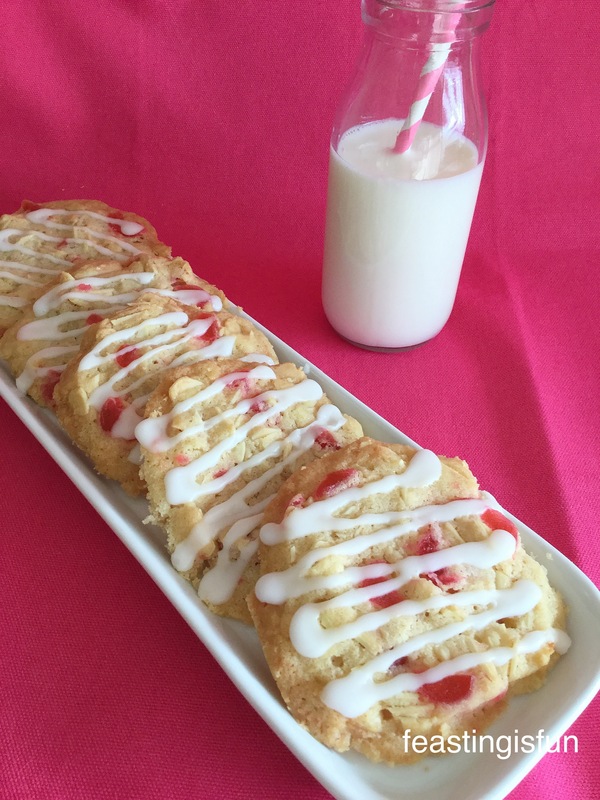 Buttery, almond and cherry cookies, drizzled with almond flavoured icing. 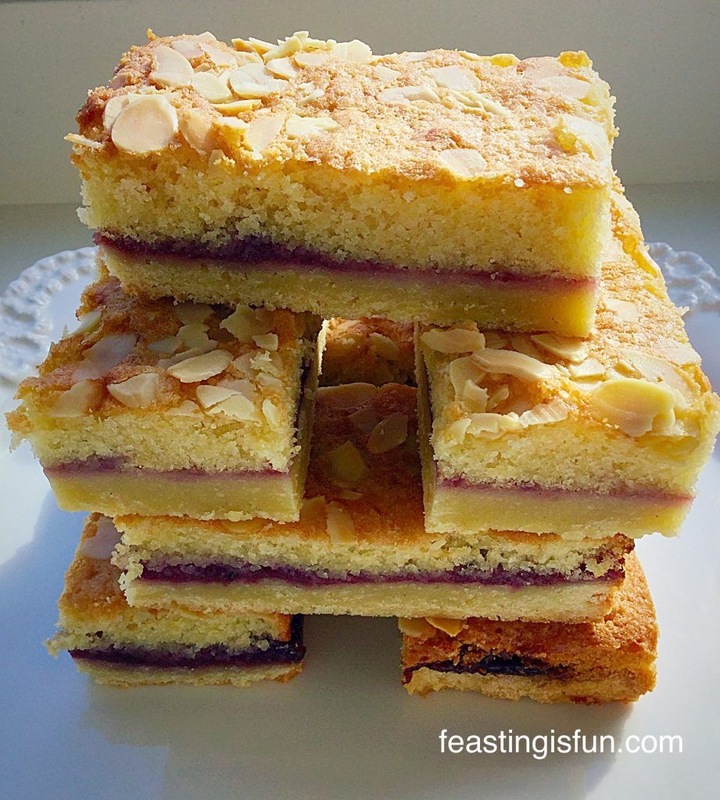 If you like Bakewell Tart you will love these cookies. Because I have been testing some baking equipment for British Bakeware, I knew I couldn’t pass up the opportunity to bake cookies, using their large baking tray. 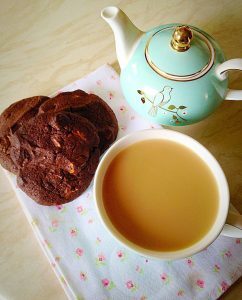 Since those of you who regularly pop round here for a chat I mean read, will know I LOVE COOKIES. 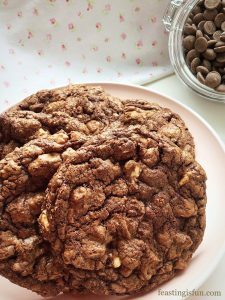 I really, really love cookies – and – please don’t hate me, I prefer nutty, fruity cookies over chocolate ones. 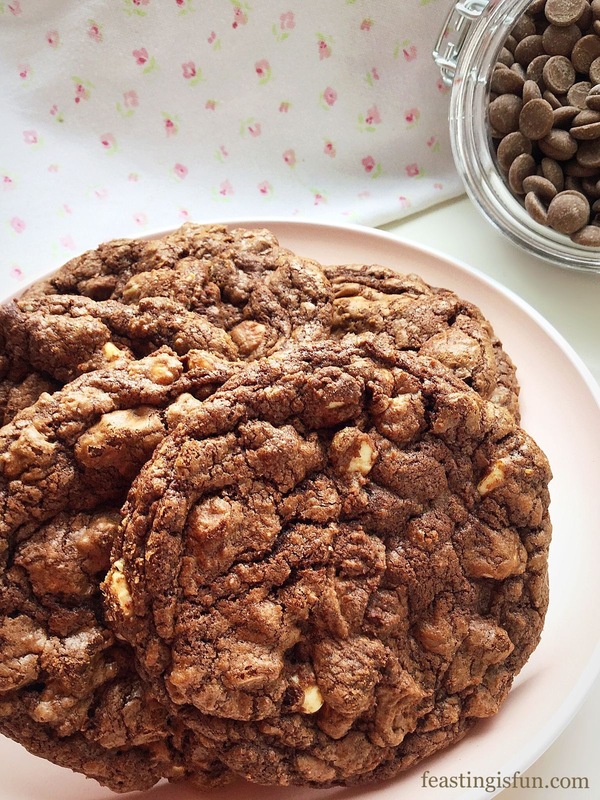 If you love choccie cookies there’s a link at the bottom of the post. I’m so good to you 😉. 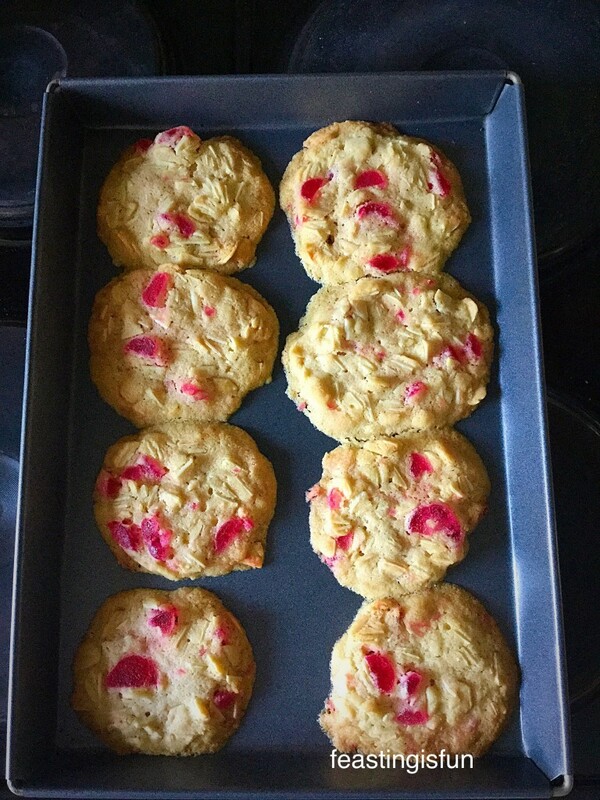 But before you click the link to the Chocolate Cookies, just have a peek at these delicious Cherry Bakewell Cookies. Can you imagine biting into this crunchy, buttery, cookie that is filled with flaked almonds, cherries and drizzled with a perfect, not-too-sweet icing? 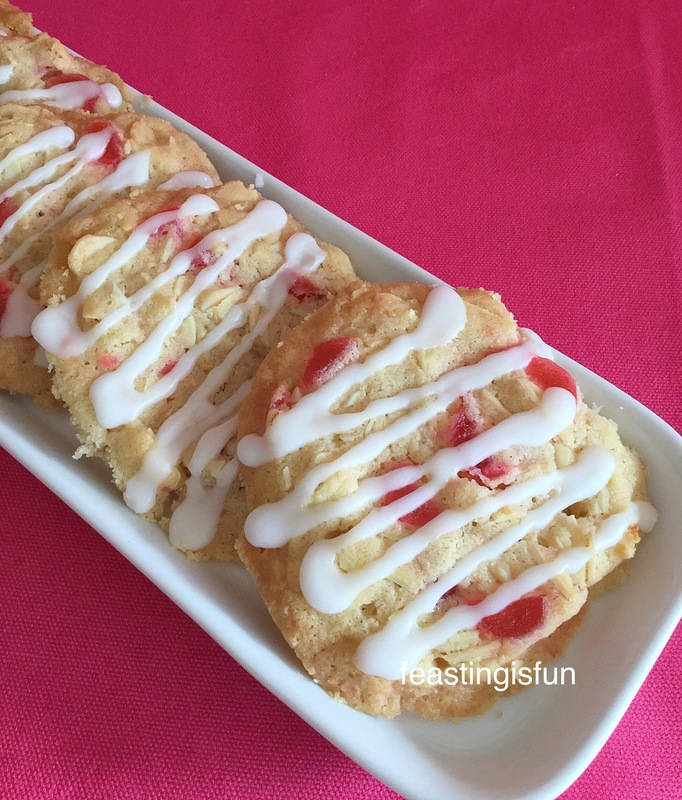 So have I tempted you to try these scrumptious Cherry Bakewell Cookies? Perfect with milk, or a cup of tea/coffee, especially as it is frrreeeezzzing outside today! 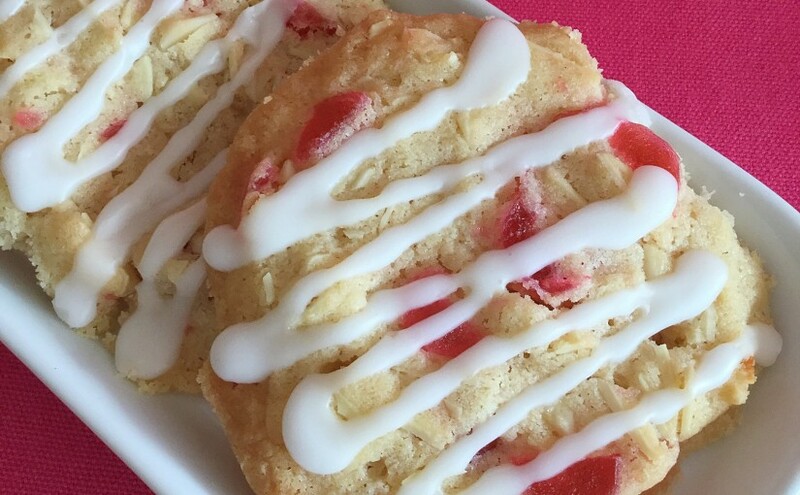 Delicate and delicious, these Cherry Bakewell Cookies are perfect any time of the day. One of the reasons I enjoy baking, so much, is that I can whip up a batch of cookies or loaf of bread and I know exactly what has gone into making them. Also I really enjoy sharing what I bake, beyond our home. By that I mean, surprising our neighbours with a gift of cupcakes, baking a gift to say thank you, or just because. And these cookies are incredibly easy to make. Once the cookie dough is made, it is rolled into logs, wrapped and chilled in the fridge and then sliced and baked when needed. Alternatively, you could dispense with the almond drizzle, just add the almond extract to the creamed butter and sugar part of the recipe, so that these retain that proper Bakewell taste and once baked these babies are ready to eat! In a large bowl add the butter, sugar and salt. Whisk until pale and creamy. Add the egg yolk and vanilla extract (and the almond extract, if not making the drizzle). Whisk together until all the ingredients are combined. Add the flaked almonds to one side of the bowl, then add the flour to the other side. 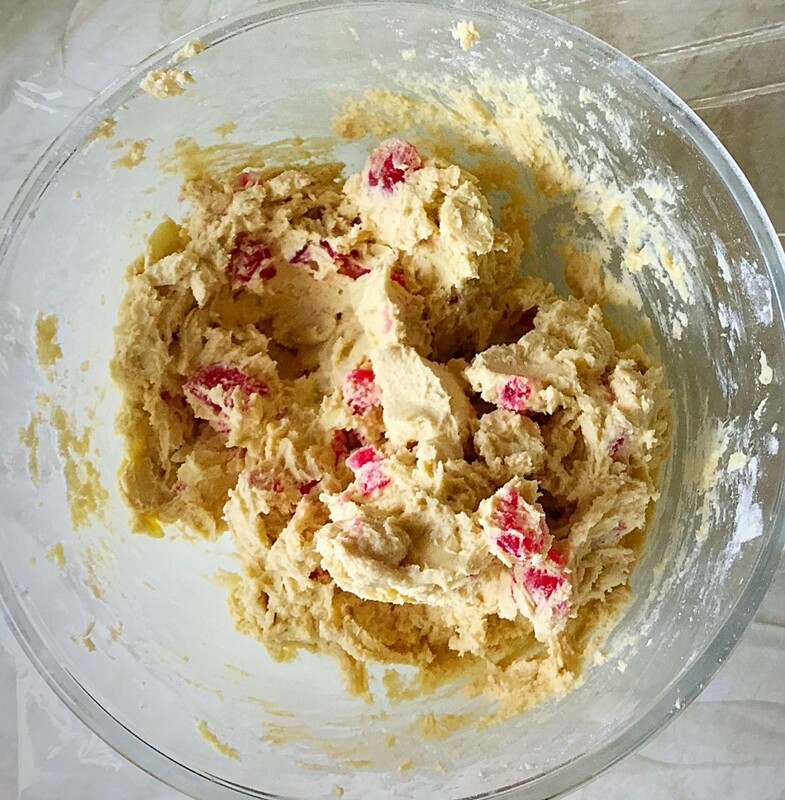 Put the cherries on top of the flour and gently mix them in the flour with your fingers – this will stop the cherries sticking together and ensure they are distributed evenly throughout the cookie dough. Mix all the ingredients together until they are thoroughly combined. Wipe the worktop with a clean damp cloth. Lay some cling film over the damp surface – it should stay in place. 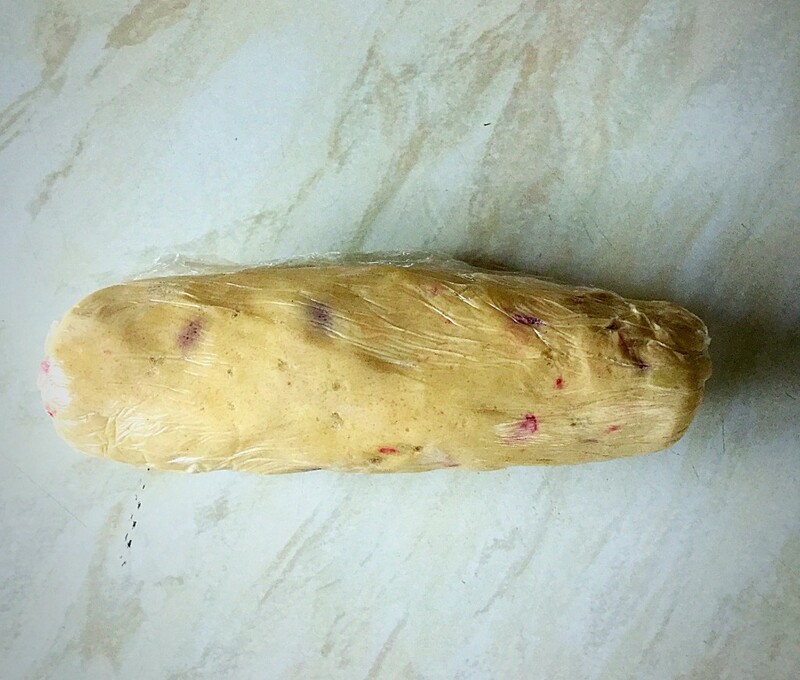 Place half of the cookie dough onto the cling film and roll into a log shape approx 4cm/1.5″ diameter. Repeat with the other half of the cookie dough. Cherry Bakewell Cookie dough log. Place both cookie logs into the fridge to chill until firm – approx 1 hour. Remove the cookie logs from the fridge and slice into 1.5 cm discs. 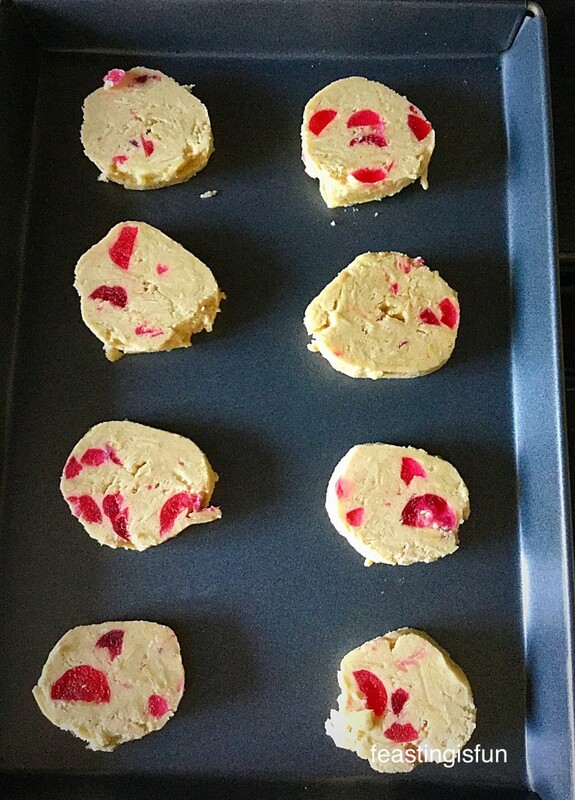 Cherry Bakewell Cookies sliced and ready to bake. I was testing this Large Baking Tray for British Bakeware however, I would advise lining any baking tray used with baking parchment. 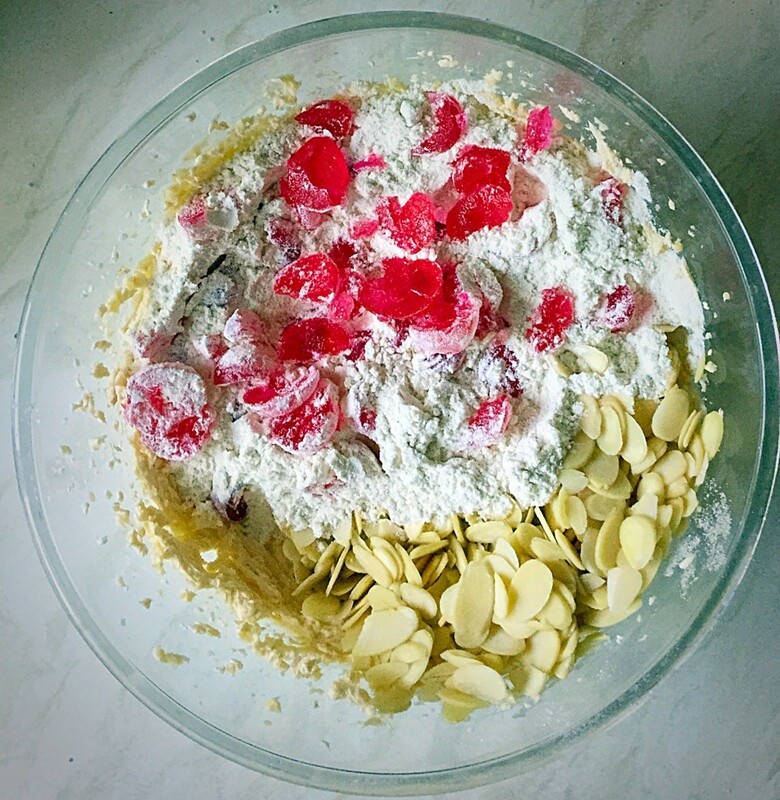 Place the Cherry Bakewell Cookies onto the baking tray, allowing room between each cookie, as they do spread whilst baking. Place into the oven and bake for 15 minutes. Do not bake for longer as the cookies will become too brittle once cooled. 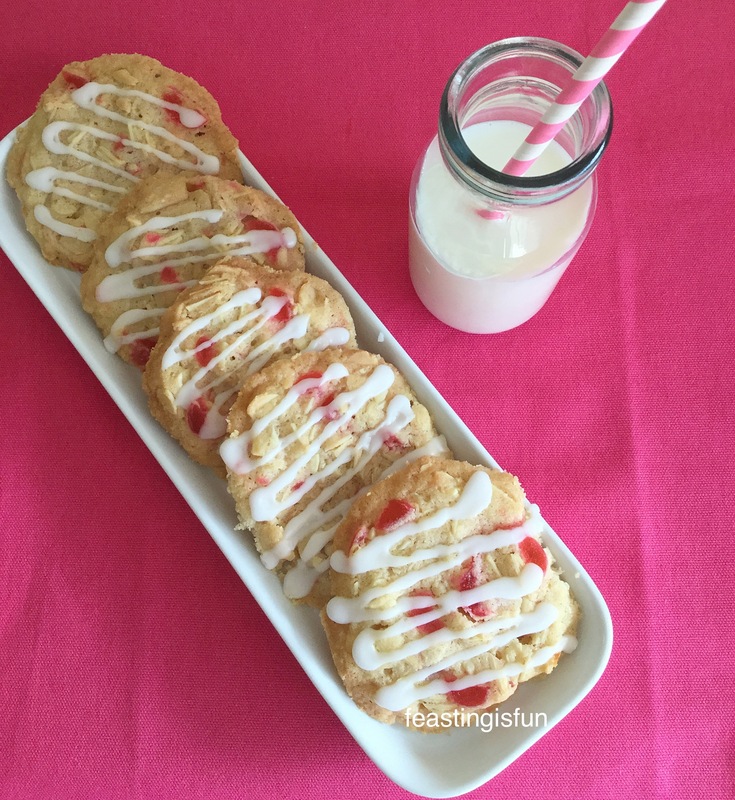 Cherry Bakewell Cookies allow to cool on the baking tray for 15 minutes. After 15 minutes cooling transfer the cookies to a cooling rack. I needed to use a palette knife to lift the cookies away from the tray. Lining with baking parchment will avoid scratching your trays. When completely cooled the cookies are ready to be iced. First of all, place the icing sugar and almond extract into a bowl. 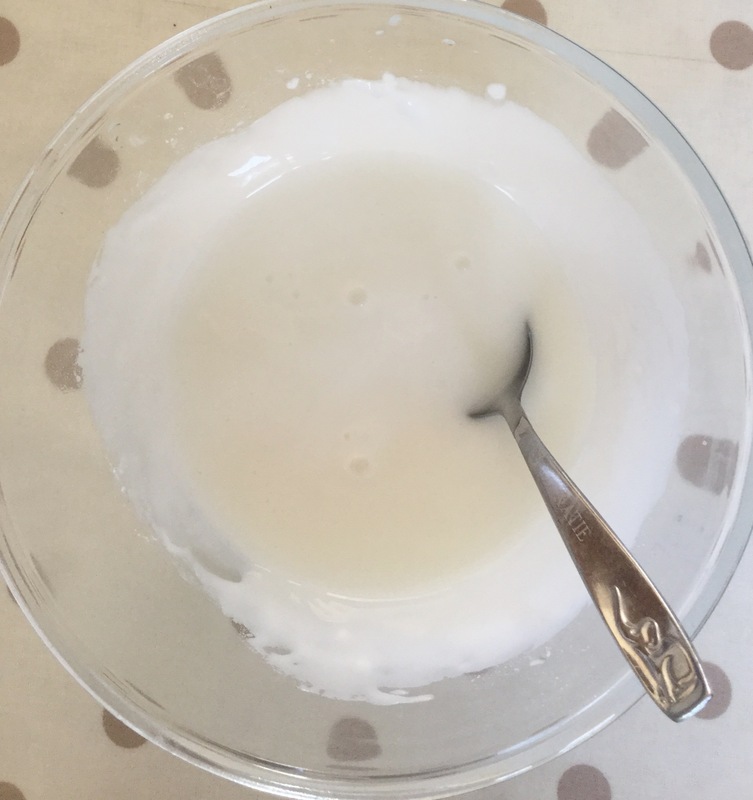 Add tap water, a little at a time (I use a teaspoon to add the water), mixing thoroughly after each addition. The icing is at the correct thickness when it can hold a figure of eight shape for a moment, when drizzled onto itself with a spoon. Almond flavoured icing, ready for drizzling over the cookies. 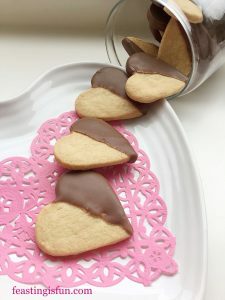 You can drizzle the icing over the cookies with a spoon, or fill a disposable piping bag (or plastic freezer bag) with the icing. Snip the end (or corner of the bag), so that there is a small hole. Drizzle a pattern over each of the cookies. Leave the icing to set on the cookies before storing in an airtight container. Do you think you can stop at one? 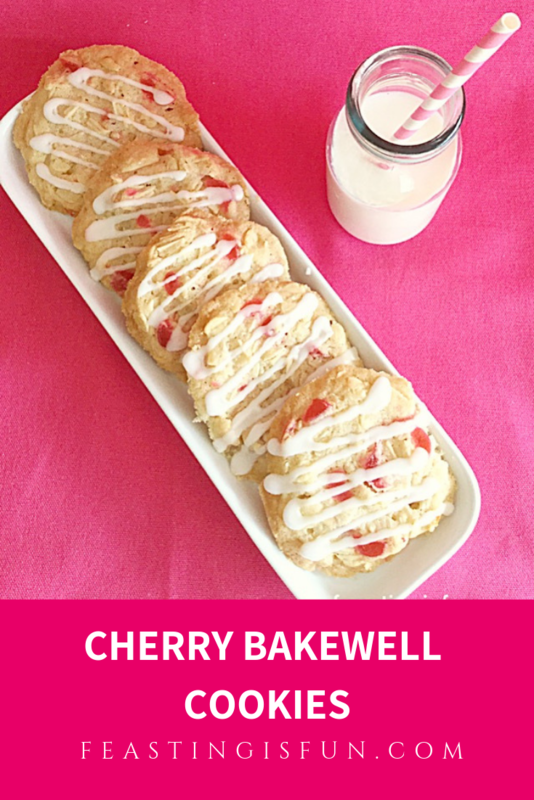 Now invite some friends round for a cup of tea and a catch up and share these delicious Cherry Bakewell Cookies. Alternatively pop some in a clear cellphone bag, tie with pretty ribbon and give away as gifts. I am always hungrier when the weather turns cold. Are you? I hope you have lots of fun baking and sharing what you make!